Author markus majanevaPublished on 5. April 2018 Leave a comment on How to best preserve filtered DNA? In sparsely populated countries, many freshwater systems are fairly remote and reachable only by, for example, walking (Fig.1). 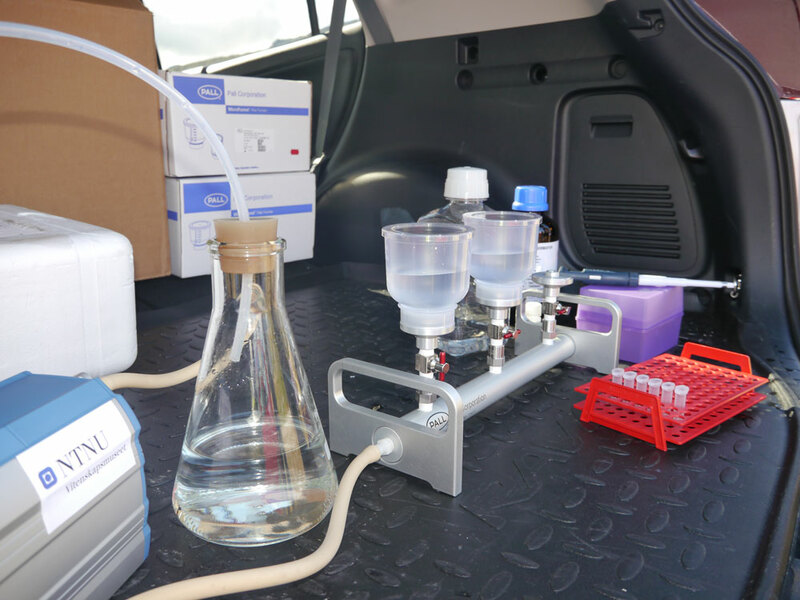 Therefore, acquiring information about the biological status of these remote systems may pose a challenge if sampling requires carrying a lot of sampling equipment to the site and a lot of sample material back to the lab. This has been the case for traditional monitoring of freshwater invertebrate communities, which is based on extensive sampling of the bottom fauna and storing the collected specimens in ethanol. Fig. 1. 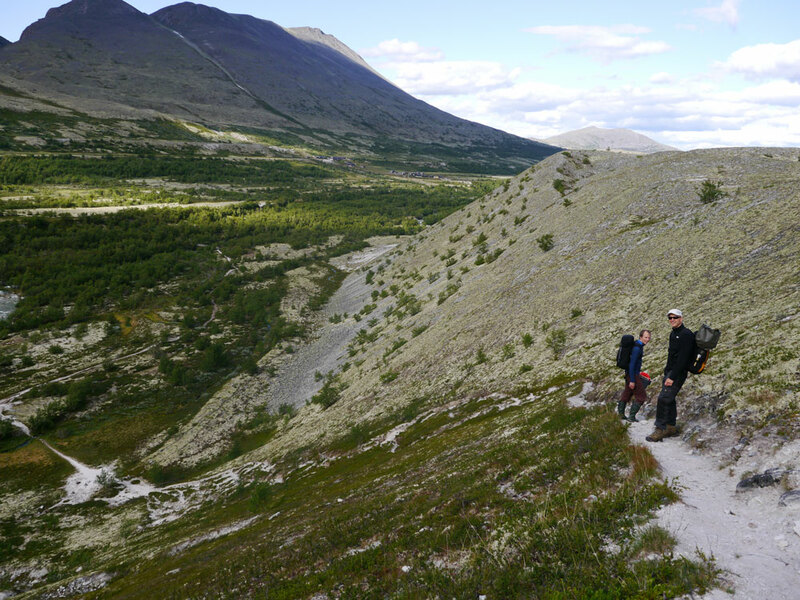 Torbjørn and Markus walking to a sampling site in the Rondane National Park, Central Norway. Photo: Elisabeth Stur cc-by. The EBAI project will develop and test new ways of monitoring freshwater invertebrates, and we identify species in environmental samples using short, standardized DNA fragments, so called environmental barcoding. By introducing this cost-effective, rapid and repeatable technique in nature management, monitoring may be expanded also to more remote locations. One way of doing environmental barcoding is to sample DNA that animals shed to their environment, in water in our case. This environmental DNA (eDNA) can be collected to a filter from the sampled water and be extracted from the filter for downstream analyses. Usually, investigators have carried the sampled water to their laboratory for filtration, but carrying liters of water from remote locations is not practical. Thus, we tested if we could carry some filtration equipment to the field (Fig. 2), and do the filtration in the field (Fig. 3), and then carry just the filters to the lab. Filtering in the field allows more sampling in remote locations and therefore, gives more data for the assessments. The critical part in the in-field filtration approach is how to preserve the filters. Fig. 2. For filtration in the field, we used an electrical vacuum pump and a manifold with three filter holder bases. We preserved the filters in microcentrifuge tubes or in sterile petri dishes. Photo: Torbjørn Ekrem cc-by. Fig. 3. We used a car trunk as our filtration laboratory and a bensin-driven aggregate as a power supply for our pump. However, the water filtration is possible using a hand pump if a simpler way is preferred. Photo: Torbjørn Ekrem cc-by. In our first experiment, we filtered 64 litres of water in the field and tested how different filtration techniques affect the eDNA-based invertebrate community results (Fig. 4). We found out that mixed cellulose ester filters preserved either dry or in lysis buffer give the most consistent community composition (Fig. 5). Thus, we advocate filtering in the field, using mixed cellulose ester filters and preserving the filters either dry or in lysis buffer. You can find the results summarized in our recently published article: https://www.nature.com/articles/s41598-018-23052-8. Fig. 4. Experimental setup. 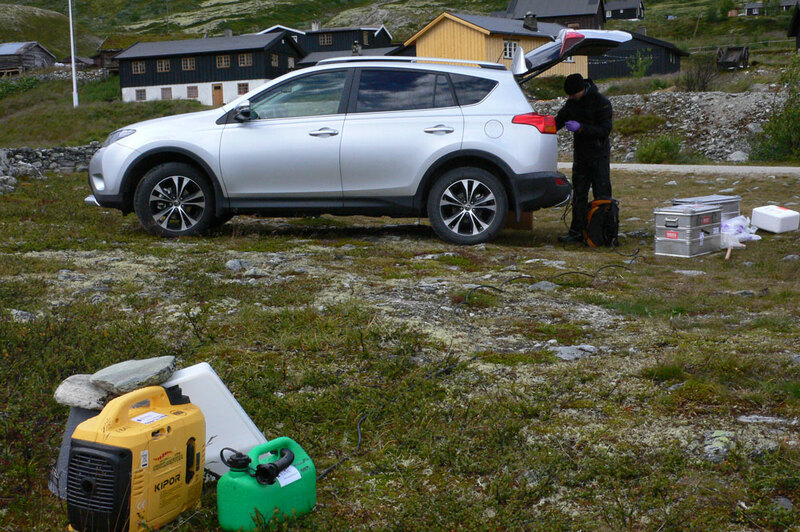 Water samples were collected from two sites, the River Atna and the Lake Jonsvatn. One litre was filtered and eDNA captured onto 0.20-µm polyethersulfone (PES) or 0.45-µm mixed cellulose ester (CN) filters at the river site. At the lake site, eDNA was captured onto 0.45-µm CN filters either directly or after pre-filtration using 12-µm CN filters. Filters were stored in 99% ethanol (EtOH), silica gel (Dry), Qiagen lysis buffer ATL (Buffer) or kept cold (Ice) until DNA was extracted in the laboratory. 500 mL of molecular grade water was filtered and the filters stored with the respective methods as negative controls (B). Fig. 1 in Majaneva et al. 2018 Sci Rep 8: 4682. Fig. 5. Similarity of community composition in River Atna (a,b) and in Lake Jonsvatn (c,d) samples. The solid line gives the mean similarity and the dashed lines give the 95% confidence intervals. 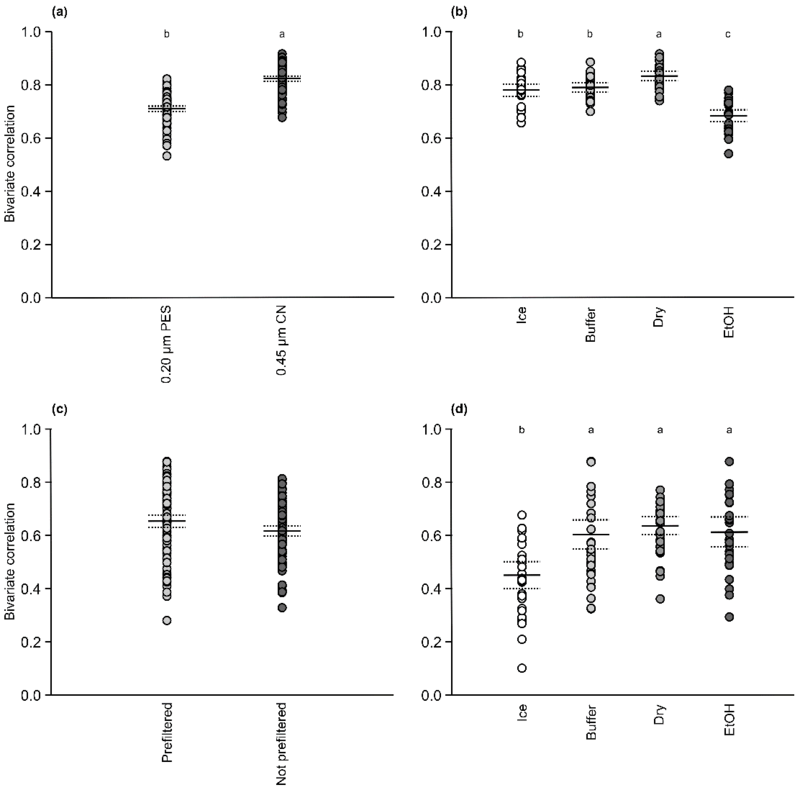 If the 95 % confidence intervals overlap, there is no difference in the methods. The small letters denote significantly different groupings of treatments. Fig. 4 in Majaneva et al. 2018 Sci Rep 8: 4682. Published on 5. April 2018 Author markus majanevaCategories UkategorisertLeave a comment on How to best preserve filtered DNA?